Clearway Gritting provide a carefully planned preventative and reactive road and pavement gritting service for the effective prevention of ice and the clearance of snow, enabling our clients to provide safe sites for vehicle and pedestrian movement during times of inclement winter weather. Clearway Gritting operates from four depots across London and the South East allowing us to be on site, on time, whenever the weather conditions deteriorate and this is the key to operating a 24hr Emergency Winter Road Gritting and Salting Service. For the past eight years, Clearway Gritting has supplied its clients with a fast, efficient and reliable winter gritting and snow clearing service. Clearway Gritting’s unique way of operating allows us not to rely on anyone one else when severe weather conditions arrive resulting in 100% efficiency at all times. We transport salt from the salt mines and docks to our depots using our haulage business. It is spread using our own specially equipped and fully automated gritting machines by our fully trained and competent staff and snow clearing carried out by machines used within our adaptable agricultural and groundwork business assists Clearway Gritting in maintaining its high standard and exceptional reputation. Clearway Gritting has just celebrated 15 years of providing winter gritting maintenance so our teams know how to prepare for bad weather. How does Clearway Gritting grit business premises effectively in bad weather? 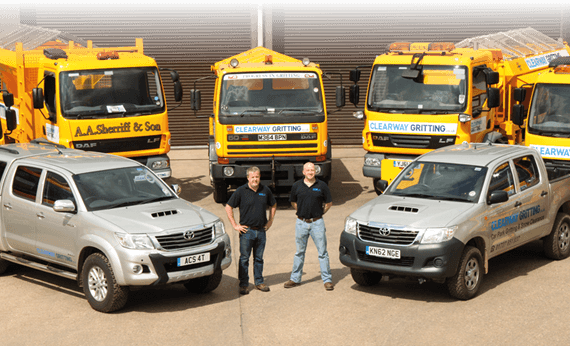 When should you employ a winter gritting company to grit your business premises?